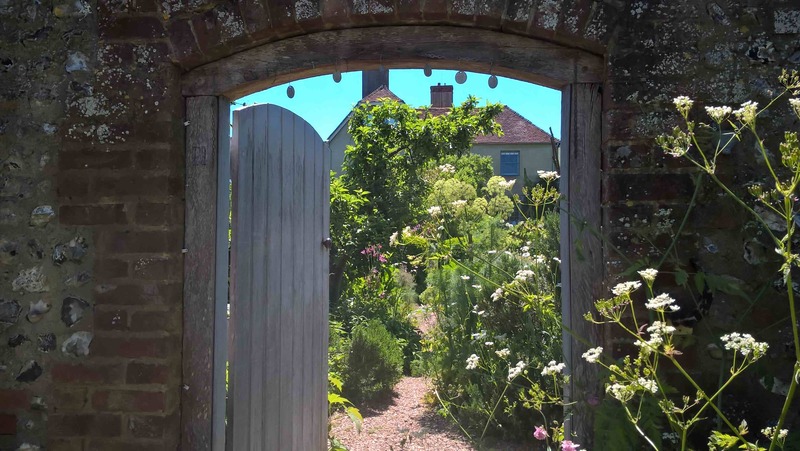 On Friday 26th May we travelled to Charleston, Vanessa Bell’s home in Sussex and now a museum of Bloomsbury aesthetics, to hear a series of talks, lectures and debates led by John Mullan, Maggie Gee and Colm Toibin. The Charleston Festival spreads over ten days and it includes writers, artists, politicians, and cultural commentators. It was Colm Toibin who drew us to the event but Maggie Gee was an attraction too because she had spoken at the ‘Postmodernist Biofictions Conference’ in SLL at the end of the Spring Term. We were also there to promote the Virginia Woolf International Conference to be held at the University at the end of June. We heard a spirited (to say the least) debate between Maggie Gee and John Mullan arguing whether ‘originality’ in literature is ’over-rated’: Mullan argued that it is and Maggie defended it as a crucial marker of literary quality. Mullan’s position relied on the argument that ‘originality’ often relies on ‘quotation’; his example of T.S. Eliot’s use of John Donne in ‘The Love Song of ‘J. Alfred Prufrock’ seemed to make his case, but it evaded important issues including the fact that ‘quotation’ (particularly in Eliot’s hands) can be ‘original’. Maggie Gee argued that the profit-driven publishing industry discourages originality to the detriment of creative freedom and literary progress. Neither speaker tackled the tricky issue of what ‘originality’ means: to Bethany and I it seemed as though both had interpreted the word in very different ways, this signifying its slippery nature. Further, neither tackled formulations of ‘value’ to which both consistently referred. Several sharp exchanges characterised the debate in which both speakers were clearly highly invested. Mullan won the case to the clear astonishment of Gee. In between scheduled events, Bethany and I had time to explore the house and grounds; we both teach modules connecting with (or centralising) Bloomsbury art, writing and debate, so this was fascinating for us, even though we are both veterans of previous Bloomsbury pilgrimages. We also found time to celebrate Bethany’s appointment as Senior Lecturer at De Montfort, though this was tinged with some sadness because of her imminent departure. In the evening, Colm Toibin discussed his new novel, House of Names, with journalist and classicist, Charlotte Higgins. Toibin is a compelling speaker, funny and charming. He spoke of his writing habits and he discussed conflict, his obsession with human relationships and motivations, his novel The Master, and his education at a now infamous Catholic boarding school in Ireland. Our subsequent conversation with Toibin was extremely entertaining and Bethany arranged an interview with him for a publication. The Charleston Festival offers the opportunity to hear literary and political stars in a dream environment. The Charleston home of Vanessa Bell and Duncan Grant is a riot of colour and shape; every chair, mantelpiece, table, window-seat, plate, and doorframe is painted with swirls and images. Bedrooms are named after the guests who regularly inhabited them including John Maynard Keynes, Lytton Strachey and Clive Bell, and heirlooms from the Stephens family remain in the bedrooms: the guide pointed out the mirror in which Virginia Woolf recalled seeing the reflection of her mother lying dead. This was an extraordinary day, in beautiful weather. We will both return to marking significantly refreshed and with a store of new contacts, sights and ideas. This entry was posted in Department of English Literature news and events and tagged Department of English, Department of English Literature, Dr Bethany Layne, Dr Madeleine Davies, English Department, English Literature, Reading, University of Reading. Bookmark the permalink.